From Dying Stars to the Birth of Life emphasises the broad multidisciplinary nature of the emerging field of astrobiology. 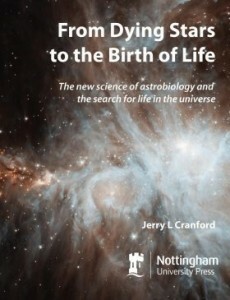 The author, Jerry L. Cranford, is a former professor of psychology and neuroscience who has a passion for stargazing and astrobiology. His book is an informal overview of the emergence of astrobiology as a new and rapidly growing subject, and is as broad as the title implies. The book aims to take the reader on a journey from the Big Bang right through to the development of instruments that allow us to observe extra-solar planet. Key scientific concepts are explained in the book with useful and colourful diagrams that make it accessible to people who do not have a scientific background. This book is suitable to anyone with an interest in astrobiology who wants a book that they can read without having to look elsewhere to understand some of the content. The author steers away from using scientific jargon, and uses informative and colourful diagrams to introduce readers to concept such as the Doppler Effect and the electromagnetic spectrum. It’s also a great book for students in the field, as it is an excellent summary of our understanding of astrobiology to date. The amount of information in the book is impressive. The first quarter of the book is devoted to explaining how our understanding of the universe has evolved due to advances in the instruments we use to see distant planets and stars, as well as techniques for measuring extraterrestrial atmospheres and lithospheres. It also covers the Big Bang Theory, the life cycles of stars and the formation of planets. The rest of the book is dedicated to exploring what life is, how life has evolved from single- celled to multi- celled organisms, and potential places within our solar system and beyond that may be suitable for life. Other topics covered include the structure of the Earth, mass extinctions and climate change, all relating back to life and the complex relationship between life and planet. Although the narrative flows well while reading, the style of writing makes it difficult to treat this book as a reference source or textbook. Subheadings within chapters are sometimes long, making it difficult to jump to pinpoint where a particular topic is covered. The first chapter is slightly confused, as it acts more as an introduction to the rest of the book, rather than a chapter about technology, as the title implies. The structure is fine as long as reading from cover to cover, which, judging from the style of writing used, is exactly how the book is intended to be read. Far from being just an astrobiology book, it is more a history of the evolution of the universe and of our understanding, really bringing together all of the disciplines that are needed to help us in our search for life elsewhere. It is the coverage of all of these disciplines and how they relate to astrobiology, as well as the relaxed writing style, that made this book a very enjoyable read for me.